Without further adieu, here is my card created from the sneak peek image you saw earlier this week. First of all, I followed the sketch challenge on Splitcoaststampers this week for the layout, then, I colored this adorable Valentine Cupid mouse with my Copics using a brush stroke technique to get the look of real fur. I popped up a few of the hearts and covered them with Stardust Stickles for sparkle, along with the wings, and the arrow was cut by hand and placed in little Cupid's hand. The I LOVE YOU sentiment comes from the same stamp set, PK-281, and it just so happens that our peachy leaders have given me one of these stamp sets to award to one lucky commenter. What do you need to do to be elegible? Well, I'd love for you to become a follower, because I only need four more to reach 1,000 , and I plan on having some wonderful prizes to give away when I reach that point, and leave a comment on this post telling me what your favorite sweet treat is for Valentine's Day. That's it! I'll choose a random winner from the comments on Monday, January 24th, and announce the winner then. Here's a little closer look at the sparkle and dimension on this card. Can you believe I refrained from embellishments on this card? I know, I know. THAT'S a Ripley's!! I decided that this beautiful paper from Little Yellow Bicycle, and the paper piercing on the corners was more than enough to frame this adorable image, and I didn't want to distract from that in the least! He's just sooooo stinkin' CUTE!! Next is a clean and simple card that I made. While playing around with the heart stamps in this set, I stamped them randomly on white card stock. I then took my Copics and colored some of the hearts in pink and red, and left some open. Kind of made my own background paper. I then took my square Nestabilities and cut the stamped card stock, and put them on this card that I embossed using my Score Buddy. As I said, clean and simple, and very fast and easy, and that allowed me to show you the versatility with this stamp set. There's definitely something for everyone with this one, my friends. I can see using this for so, so many things!! Below is a picture of the wonderful and versatile PK-281 stamp set that I'll be giving away on Monday. Now your next stop on this glorious hop will be at the sweet and talented Heidi's Got Scraps blog. Heidi has something fabulous and fun to share with you, so you'd better get hopping!! Below is a complete list of stops in order, should you get lost along the way. Thanks so much for hopping along with us tonight. I hope you've been inspired along the way, and I wish you much love, laughter, and of course happy stamping! Oh so cute....... I love anything valentines day. TFS you great work. Your mouse is adorable. I wish I had the patience to color. I like those red hearts that taste like cinnamon. I love that Valentin Cupid stamp set, too. Way cute. I love this little guy! His expression is priceless. My grandkids will love him. Super cute cards! I was follower # 998! How exciting that you are almost to 1000!!! I know you'll blow that out of the water tonight :) I just broke 300 on my blog... come by and check out what I'm giving away! I love the faces too cute! Who wouldn't want a fabulous card like yours, that is the sweetest!! My favorite sweet treat is Ghirardelli with carmel, yummy!! Oh my I love those new stamps. A must have! What a cute sneak peek. O M G!!!!! LORIE THESE ARE BEAUTIFUL LIKE ALWAYS MY FRIEND!!!! YOUR COLORING IS JUST AMAZING!!! I will be sitting right next to you @ CHA to see if your creativity will rub off on me!!!! Am I really first?! My favorite Valentine's treat is, of course, chocolate! We have a Russell Stover's store and my hubby always gets me a heart shaped box for Valentine's Day! I love the cards. The three block with the hearts is my favorite I love the simple yet eligant look of the card. My favorite treat of course is chocolate, isn't it everyones? The mouse is so cute - I love it! Wonderful cards. Having fun hopping so far!! Love the stamp set, can't wait to order them. My favorite sweet treat for Valentine's day is the one my Mom loved best, brings back great memories - sweet/sour cherries. Great cards, love the mouse! So adorable!!! I love your technique to color fur, you're the best!!! OMG this is too cute!! My favorite valentines treat is Hersheys kisses!! I am already a follower if I could follow twice i would hehe!! Love Love Love the new stamps, especially the Wide Eyed Kids.. These stamps are so cute. I'm in big trouble! That is one cute mouse! So cute! I'm so loving PK. I can't wait to be able to get my hands on them. Lorie, these cards are just so adorable. I love the little cupid. He can steal my heart any time. Speaking of hearts, my favorite Valentines treat is those heart marshmellows. MMMM yummy. Super card! I love PK stamps. My favorite treat is chocolate covered strawberries. You are so talented! I hope someday to color as awesome as you! Your cards always look like a work of art. Amazing work like always! I love both of your cards. This little mouse set is super cute! hi, i'm a new follower... love your project with new peachy keen stamps... my valentine's sweet treat is always chocolate... I love chocolate. I love your card...that face is too cute. Wow another first commenter. Your cards are so nice and love the mouse. Great stamp set. My fav sweet treat is chocolate covered peanut clusters. Anything Chocolate is a favorite of mine for Valentine's day!! Oh Lorie I knew I was in trouble when I saw I had the same set as you!!! These are adorable...Love the cute little furry guy. Fabulous job. I became a follower. My favorit sweet treat for Valentine's Day is the Reese's PB Hearts. amazing coloring! I would love to learn how to use copics. Those heart stamped cards are adorable. As usual Lorie - just fantastic! That mouse is adorable. I just love your card. That stamp set is to die for! My favorite sweet treat is anything chocolate. This little mouse is so adorable! I love Stickles! I just like getting plain ol chocolate. love your card! I became a follower. Congrats on the number of followers. I love chocolate covered strawberries for my valentine treat. This is so cute!!! I love that little mouse. My favorite treats are the conversation hearts. TFS!!! Love this little mouse, reminds me of Jerry on the cartoon Tom % Jerry Yah I know I am dating myself but he's just so darn cute. They are so adorable. Love the mouse!! Thanks for sharing. Love both the cards! Cupid is SO cute!! So cute. Love how much expression PKS can offer on faces. I love the face on the mouse, very cute!! Lorie, your cards are adorable! The stamps are amazing! I love getting good chocolate for Valentine's Day. Oh Lorie he is too cute!! I LOVE your brush stroke coloring!! He could almost pop off the page he looked so real!!! AMAZING!!! Thanks for sharing!! Love the card. My favorite treat is reeses cups. You did a fabulous job on this card! It is super cute! Adorable! I love his cute little curly tail!!! Adorable! I love the mouse! Valentine's is definitely the time for chocolate... preferably with nuts!! I loved the way you embellished the mouse stamp, but the second card is my favorite. The detail work using your Score Buddy is simply brilliant and makes the card quite elegant. Thanks for the inspiration. Another great card, well two, from you!! I adore the simplicity of the second one - right up by alley and I hope you don't mind if I case it!! OMG Lorie...this is really really fantastic! The coloring on this is so wonderful...it does look just like fur!!! Impressive!!! My favorite sweet treat for Valentines is dark chocolate! TFS! So cute... amazing coloring as usual.. My fav thing about Valentines Day is everyone tells the special people in their lives they love them. Should be Valentines Day EVERY DAY! Time to hop hop hop to see more eye candy! Super cute cards. My favorite valentine sweet treat is "Turtles". Your card is so adorable. My favorite sweet treat for v-day are those candy hearts. Your cards are very nice. You did an awesome job on the little cupid, beautiful coloring. Thank you for sharing. I love your cards!! You put a lot of effort into these, they are amazing. I love conversation heart candy! Alright Miss LORIE! These cards are both GORGEOUS and in their own different ways! I love them!!!! Great job showcasing the stamps! My favorite Valentine's treats are sweet-tart conversation hearts. Oh yes, and CONGRATULATIONS on over 1000 followers!!!! WOO HOO!!! You go girl! Lorie your cards are fabulous! I love the paper piercing, the layers, the glittered hearts, and of course your coloring! I love your scoring on the other card! It looks so elegant! Beautiful job as always! Your card is so darn cute!! I love these new stamps. New follower here! I just love your card! The brush technique turned out great! My favorite Valentines Day treat is chocolate covered strawberries!! what a cutie!! love your cards! So cute Lorie!! You are one talented lady!! that mouse is the cutest !!! I love it, you did a beautiful job! Very cute!!! I like these new sets, TFS! The cupids are TOO cute, love your project! Very nice project and thanks for the chance to win the new stamps!! soooo cute!! My favorite valentine treat is anything caramel and chocolate, my boys usually eat all the others in their candy boxes and wrap up those for me!! awww soooo cute i love both! thanks for sharing! Very cute cards! I love the stamp set. So, so cute. My favorite sweet treat for Valentine's Day are the Lindor Truffles. Yummy! Gorgeous cards! 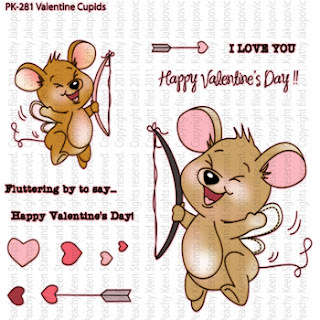 That mouse cupid is soooo sweet! I'm already a follower but looks like you easily made it to 1000! Congrats! Great cards. The new stamps are awesome. I got Copics for Christmas and can't wait to learn to use them. Very nice projects. I especially like the second one. So simple, yet special. Lorie, you never cease to amaze me with your coloring skills. You are the ultimate copic queen!!! My favorite treat is Chocolate covered cherries. Thank You for being in the hop and for showing the different ways to use the stamp set. Just adorable!! I LOVE the little mouse, he is so cute :) Thanks for the chance to win, and congrats to making it ove 1000 followers! So very cute! I love that little mouse, and the heart card is gorgeous! Your mouse card is so cute! I love all the special touches. My favorite treat, though I don't like chocolate, is chocolate covered cherries. TFS and the chance to win. Too cute....love that mouse and I usually don't like mice. My favorite treat is white and pink conversation hearts. Those are the two must have colors that I always pick out! Such great projects!! Can't wait to get my hands on some of these stamps! CONGRATULATIONS on over 1000 followers!!!! I just love both cards you did a great job on them. Thank you for sharing. My favorite Valentines treat is the spicy red hot hearts. HOW CUTE! I just LOVE these stamps! I'm already a follower.. thanks for a chance to win! These new faces and images are just too cute for words. I want them all. Love your card!!! thanks for sharing. I really like how you used the heart stamp to make your own background. I love chocolate covered strawberries for a sweet treat. This release is just too cute. Can't wait to win these. Wowww Lorie... I LOVE LOVE LOVE your beautiful cards. Lovin' every detail you have put into each one. Thank so much for sharing your amazing talent! You are very talented! Love your cards! These are just adorable examples! Thanks for sharing! Both of your cards are adorable! You did a wonderful job on painting the mouse, he is so cute! I have lots of grandchildren for whom I can make Valentine cards using those cute little mice! o love the mouse! this is so cute! I agree this set is to cute! I cannot wait until this set is released, more to add to wish list!! Never seen a cuter cupid! Lorie these are so sweet. What a happy little fellow :) He made me smile. Your simple card is very elegant. TFS them! I am also following your blog too. Lorie the little cupid mouse is so so cute. and congrats on going over 1000 followers. What an adorable card. I love the mouse and how it is colored. I would have to say that my favorite sweet is anything chocolate. Thanks for the chance to win. Oh soooo cute--you have some beautiful work! Love how you colored the mouse. Oh that is such a cute mouse!! I love any reese's hearts! This mouse is too cute. Your cards are adorable!! The mouse is so stinking cute. Thanks for sharing and for a chance to win. That mouse is too cute! I really like the second card, simple & elegant, like the color combo! Omg! Now that is THE cutest mouse ever! Wow your coloring is just amazing! Awesome job like always..I'm so happy to be on Such a great team of talented people! I'm now following your blog! The coloring on the mouse was fabulous! I LOVE the card too. Thanks for sharing! My favorite treat is chocolates! I am a new follower! I would say I love all the chocolate! Have a new follower in me! I love the card :) Thank you for sharing!!! LOVE the cards! MY favorite are the conversation hearts! Oh cuteness the coloring on this thing is AMAZING!!! My favorite treat is chocolate chocolate and some more chocolate!!! :) Great projects. I simply adore your heart stamped card!! My favorite treat is chocolate covered strawberries! Yum! Oh yea he is adorable! Your coloring is wonderful. Great card. I will take dark chocolate any thing. Even wine. Really! These are so incredibly cute! this mouse is ADORABLE!! Omg, I am loving this blog and all the new stamps! That mouse card is adorable and I LOVED the coloring you did on it. Definitely a talented woman. TFS! Love anything chocolate and nutty. Your card is stinkin cute! I am a new follower too, great site!! I am already a follower!!!!! Love both cards!!! CUte mouse and your coloring is so beautiful! They are just all so adorable!! its hard to pick just one stamp set to get! Super cute! Love your cards! Your cupid is the cutest. OMG... I am sitting here drueling! I LOVE both of your cards! I think the mouse card is just gorgeous! I so wish I could color like that! Your 2nd card is so simple but extremely elegant! I have those spellbinders...hmmm! I love that stamp set too! ugh! My favorite treat for V Day is Lindt! I had left a comment stating that your coloring of that mouse was magnificent on the previews!!! love it!!!! What a cute card... gives me some guidance when I get my set in the mail. tks for sharing! Oh this is so adorable. I love it and I'm loving the new stamps. Chocolate and cute card ideas. I think I have died and gone to heaven! Thanks for the chance. I love your adorable cards. I really like the heart technique. how cite is that little mouse? My sweetheart use t o always get me something crafty for Valentines day because I didn't care for sweets!! Really cute. This set is so pretty. I'm only three blogs in and I'm so in love with them all!!! I became a follower too! Wow these cards are beautiful! Thank you for sharing! I would LOVE to own any of the peachy keen stamps! OMG the set is too cute. My favorite is any thing Chocolate. Love your blog. Love it Love it Love it! Did I say I love it. New stamps are stinkin cute. You're an incredible designer always inspiring. TFS. Oh my Lorie! I knew you would give us a real treat, but you've put sugar on the top!!!! Your first card is awesome with that cutest of mice, coloured so skilfully and that CAS card...well! It's just STUNNING my friend! Can't wait to see more of your cards from the release. oh wow, both of your cards are fantastic, and I love the simplicity of the second one! My favorite Valentine's treat is Hershey's Kisses. Fairly standard as far as a treat goes, but I can't get enough of them. Thanks for sharing and for a chance to win!